Weigela (Weigela spp.) is a deciduous shrub noted for trumpetlike flowers that attract hummingbirds and butterflies to the garden in late spring. Most varieties are suited to U.S. Department of Agriculture plant hardiness zones 4 through 9 or 10. It's a traditional feature of cottage gardens, and several weigela cultivars have variegated foliage, dwarf forms and even second bloomers. “Wine and Roses” (Weigela florida "Alexandra" Wine and Roses) was the first of the wine series of cultivars to debut. Grown in USDA zones 4 through 8, it's characterized by pink-to-red flowers and deep burgundy leaves that turn dark purple in fall. “Fine Wine” (Weigela florida "Bramwell" Fine Wine), also growing in USDA zones 4 through 8, features the same foliage color but rose pink blossoms. "Midnight Wine" (Weigela florida "Elvera" Midnight Wine), another in the wine series, is a dwarf version of “Wine and Roses” that thrives in USDA zones 4 through 9. Because it only reaches a maximum height of 2 feet, it works well as a low hedge or border specimen. “My Monet” (Weigela florida "Verweig" My Monet) is another compact variety that only reaches up to 18 inches in height in USDA zones 4 through 6. With green and white variegated leaves and raspberry pink blooms, this cultivar provides high contrast used as a hedge or foundation plant. Fans of the classic shrub with green leaves will enjoy “Rumba” (Weigela florida "Rumba"), a semi-dwarf variety that can live up to 30 years in USDA zones 4 through 8. “Ghost” is so-named because its yellow-green leaves fade to butter yellow in mid- to late summer, although its crimson red flowers remain vibrant. Suitable for USDA zones 4 through 8, this variety is particularly deer resistant, but irresistible to hummingbirds. “Rainbow Sensation” (Weigela florida "Kolmagira" PP20384) is a mounding, three-season bloomer for USDA zones 8 through 10 that boasts delicate pink flowers and variegated yellow and green leaves. Cultivars in the sonic bloom series flower nearly continuously until frost in USDA zones 5a through 8b without the need for deadheading. With bright green leaves and hot pink flowers, “Sonic Bloom Pearl” (Weigela florida "Bokrasopin" Pearl) displays well in mixed borders and around foundations. “Sonic Bloom Red” (Sonic Bloom Red Weigela florida "Verweig 6") has similar characteristics but has bright red flowers and medium green leaves. 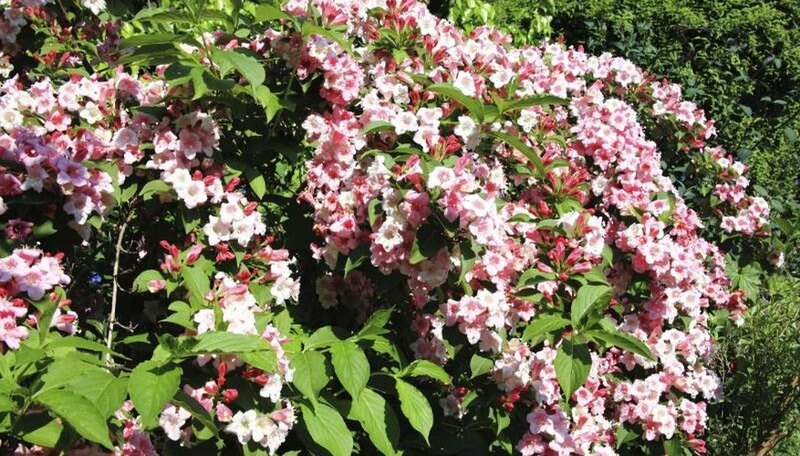 Like all weigela varieties, reblooming types produce optimal foliage and flower color if planted in full sun, but they will tolerate some shade. Missouri Botanical Garden: Weigela Florida "Alexandra"
Karyn Maier is a seasoned columnist and feature writer. Since 1992, her work has appeared in Mother Earth News, The Herb Quarterly, Better Nutrition and in many other print and digital publications. She is also the author of five books, and is published in six languages.